This project is to renovate the original 1929 library facility. This is a 17,000+ square-foot multiple-story building. The work includes tuck-pointing, new electric, HVAC, plumbing, lighting, and elevators. Full details are available in the bid packet. As of Friday, August 2, 2013, bid packets may be purchased at Commercial Documents, 1712 Macklind Avenue, St. Louis, MO 63110, (314) 678-0087; or examined at Southern Illinois Builders Association, 1468 Green Mount Road, O’Fallon, IL 62269. (618) 624-9055. A mandatory pre-bid conference will be held at the project site on Friday, August 9, 2013, at 10:00 a.m.
Bid deadline is 2:00 p.m., Thursday, August 29, 2013, when a public bid opening will occur. Late bids will be rejected. 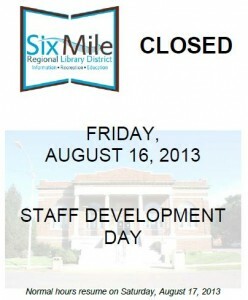 The Six Mile Regional Library District reserves the right to reject any or all bids, to waive irregularities in the bidding, and to award the contract to the lowest responsible bidder. If the contract is awarded, the successful bidder will be required to post performance, labor, and materials payment bonds. In addition, the successful bidder will be required to comply with all applicable laws including payment of prevailing wages to all contractors and any subcontractors, and compliance with the Illinois Human Rights Act. Additional information including minimum qualifications for bidders, form of bid, form of contract, plans, and specifications are in the project manual. Thank You to Our Adult Summer Reading Program Sponsors! Posted in Reading Program | Comments Off on Thank You to Our Adult Summer Reading Program Sponsors!